Updated Saturday July 30, 2016 by AUBL Miami. 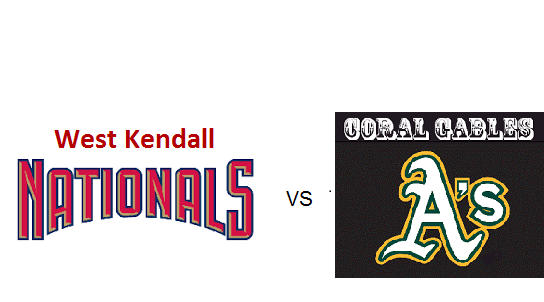 Kendall Hyundai presents AUBL Miami Semi-Pro Baseball special event broadcast game of the week West Kendall Nationals vs Coral Gables A's Sunday 7/31/16 at 3:30 pm from University of Miami Mark Light Stadium!! This special event will be broadcasted on the AUBL Miami Baseball Network. Commentators will be Jay Habacht and Christopher Femino. This will be an another EPIC showdown between 2 past AUBL Miami champions!! Spring 2015 Champions Coral Gables A's are led by their Spring 2015 Co-Cy Young award winners Alex Arteaga and Willy Mizrahi. Arteaga was last week's player of the week and is now 4-0 and has a 1.29 era this season in 28 innings pitched. The A's offense is led by Pee Wee Rodriguez, who is hitting .500 in 4 games played. The A's are 4-1 and are in 1st place in the National Division. Spring 2014 and Fall 2014 Champions West Kendall Nationals feature a top pitching combination as well - former Cy Young winners Gaby Lorenzo and Eric Berkowitz. Offensively, Yuri Lopetegui leads a high powered offense with a .600 average - 7 of his 9 hits are doubles! The Nationals are 4-1 and are in 1st place in the American Division.